The Voice Newspaper is a well known publication in London which has run from 1982, and has been regularly voted “Britain’s Best Black Newspaper” for their coverage on a range of issues specific to the community including sport, current affairs, education, lifestyle, faith, career opportunites and entertainment. 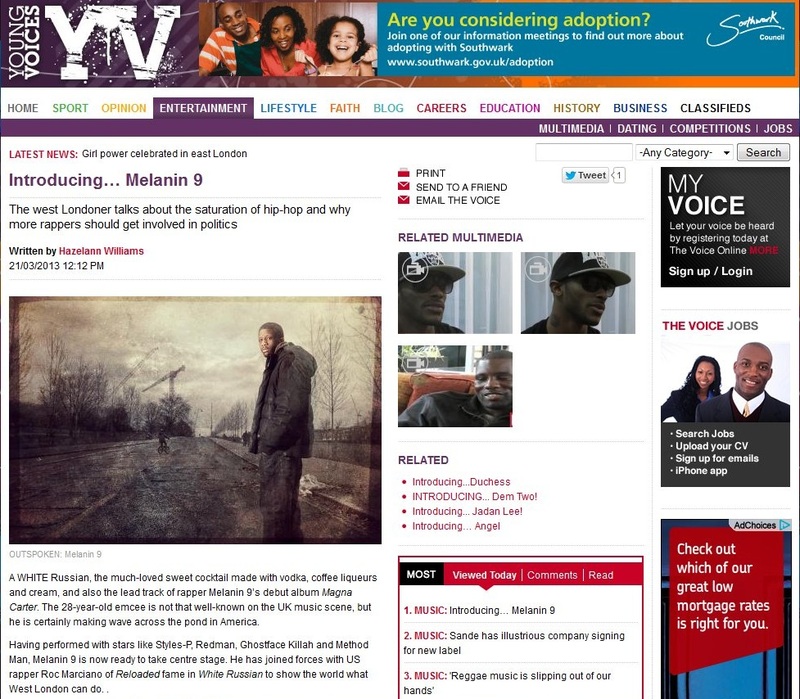 The papers’s Hazel Ann Williams took a trip up to Islington recently to interview one of the hottest emerging figures in the UK hip hop scene, melanin 9, to discuss his new album Magna Carta, his early days of starting out as an artist and his views on hip hop generally today. There has been a tremendous amount of media coverage on Magna Carta in the UK primarily, and also in Europe and the United States since the promotional campaign began in the autumn of 2012. Hip Hop specialists, general urban music online and physical magazines, and national physical publications such as Clash, MOJO and Q Magazine have all featured reviews and interviews. We predicted this, his debut album, would be a landmark release for this highly talented lyricist, and the international online coverage of his freestyle for SBTV and official videos, including “White Russian” ft Roc Marciano, premiered by Nah Right – a first for such a UK artist – has proven this to be the case. Expect to see a video for the track “Heartless Island” featuring Triple Darkness in the near future, as well as him performing some shows, including on the main stage at the Boom Bap Festival in September.